Zagasnack snack promo pack bags. 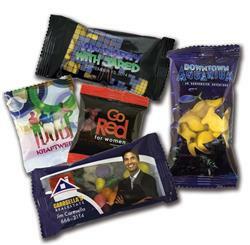 These custom snack promo pack bag treats will take your brand to the next level with breathtaking four color process graphics. A 3" inch bag filled with Jelly Beans, Signature Peppermints, Red Hots, Gum, Spearmints, Swedish Fish, Hershey Kisses, Tootsie Rolls, or Gumballs. Best promo pack value in the industry. 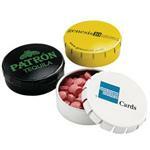 FULL COLOR, directly imprinted retail look. Place a custom window for no additional cost! 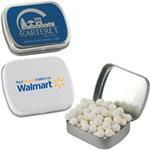 Typical Imprint Area(s): Decal size - 2.08" x 1.58"
Available Imprint Options: Four color process decal. Add $.25 additional each for chocolate fills. Jelly Beans, Signature Peppermints, Red Hots, Gum, Spearmints, Swedish Fish, Hershey Kisses, Tootsie Rolls, Gumballs. Shipping Weight: 300 carton / 22 lbs.